Richard Case and Jason Nickerson both replied quickly to my question. It appears to be a fairly well known marking, to experienced mud collectors. It is on a Canadian made U 2611, with an early CP mark. 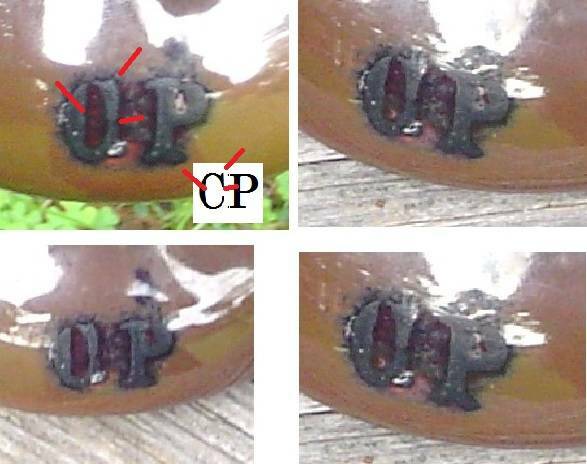 In the collection there were three with this exact same mark, some with the newer P inside C stamp and some unmarked. Quite an assortment as every one was a different colour, as you would expect in older porcelain. I was offered to take one as a gift. I chose this one because of it's colouring and the large pin hole making it different from any others I have seen. Three features (marked) indicate the mark is an early C of a style that matches the P.
-the separation in the middle of the "C"